DDPS has extended the range of the OptiMix reactor to provide improved heat transfer and reduced processing times. This new design circulates the thermal fluid contained in the half-coil through the baffles. This results in an increased heat transfer area up to 25% enabling more homogeneity, faster thermal management and shortened cycle times. 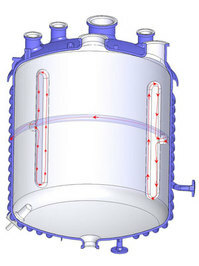 OptiMix is a patented reactor design that optimizes the mixing performance of glass-lined reactors by integrating three baffles on the vessel wall. 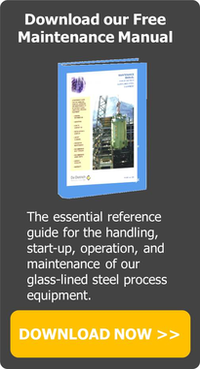 OptiMix reactors are lined with 3009 glass for superior corrosion resistance. All clamped-top/CTJ OptiMix reactors come standard equipped with a pitched-blade turbine; closed-welded/GL OptiMix reactors include a GlasLock agitator with adjustable blades. A fixed speed drive is vertically mounted to keep nozzles and accessories unobstructed for operational use. 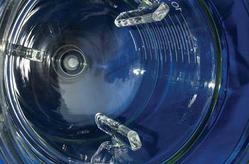 OptiMix baffles are also available in QVF Borosilicate Glass reactor designs. Improved CIP efficiency by eliminating the difficult to clean top head pocket at the baffle/nozzle interface. Vortexing and splashing are significantly reduced, resulting in less product drying and sticking to the heated wall above the liquid surface. Design enhances heat transfer, solids suspension and distribution, gas dispersion, gas flow rates, and mass transfer through improved mixing. 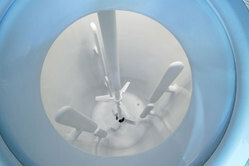 The symmetrical baffling of the OptiMix reactor reduces shaft deflection and extends seal life by minimizing the bending loads that are imposed on the agitator shaft.